Now, I haven’t visited enough of America to back that statement up with facts… but based on my recent visit, I would venture to say it’s a pretty accurate description. Modern amenities are in short supply here- no public bathrooms, no running water, no trash disposal, no Starbucks (I know, that last one is the real kicker). No power lines run through, but impressive solar panels and generators are a clear indication that local residents aren’t just on a glorified camping trip- they’re committed to living life out here. What is it about this place that beckons thousands of snowbirds here throughout the winter (some residing permanently, even through the scorching heat of summer)? Maybe it’s the wide open vistas, the crazy cool art installations, and the chance to escape from the oppressive burden and expectations of modern society. Living simply in the wildest sense of the word. FREEDOM. Originally this was the site of a USMC base; later on when the military structures were torn down, the concrete slabs from the buildings remained. Over time, people began to gravitate to the area, some stayed… and eventually, ‘Slab City’ was established. 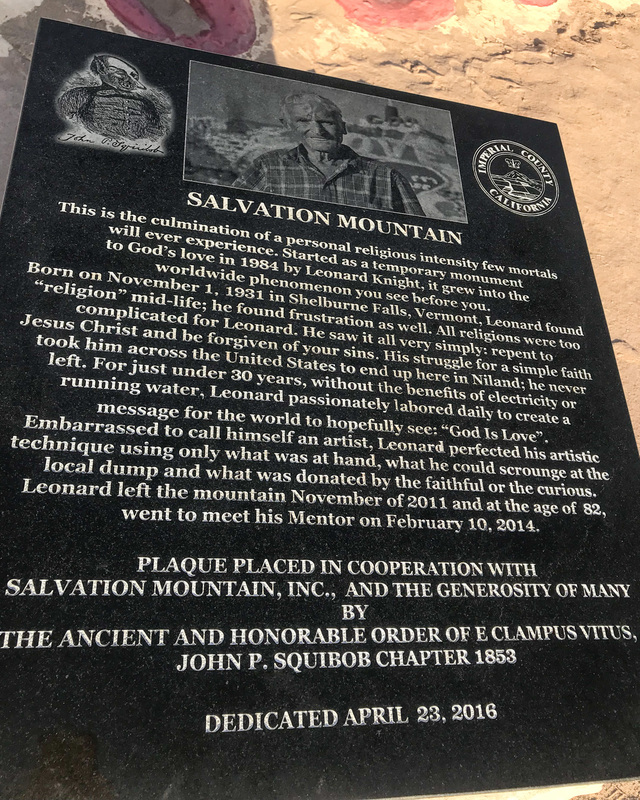 One of the most well-recognized landmarks of the community is Salvation Mountain: a literal man made mountain, sharing a resounding message of faith and love. 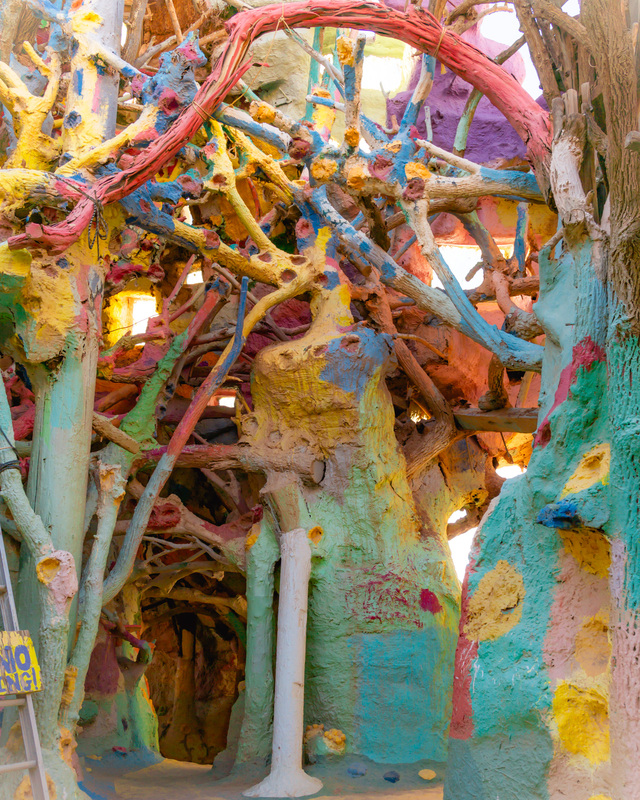 Created over a span of 28 years by Leonard Knight, this colorful structure is made up of adobe, straw, and lots of paint- well over 100,000 gallons, according to the artist himself. You really believe in love then? Yeah. Totally. This is a love story that is staggering to everybody in the whole world. That God really loves us a lot. Does that answer that? 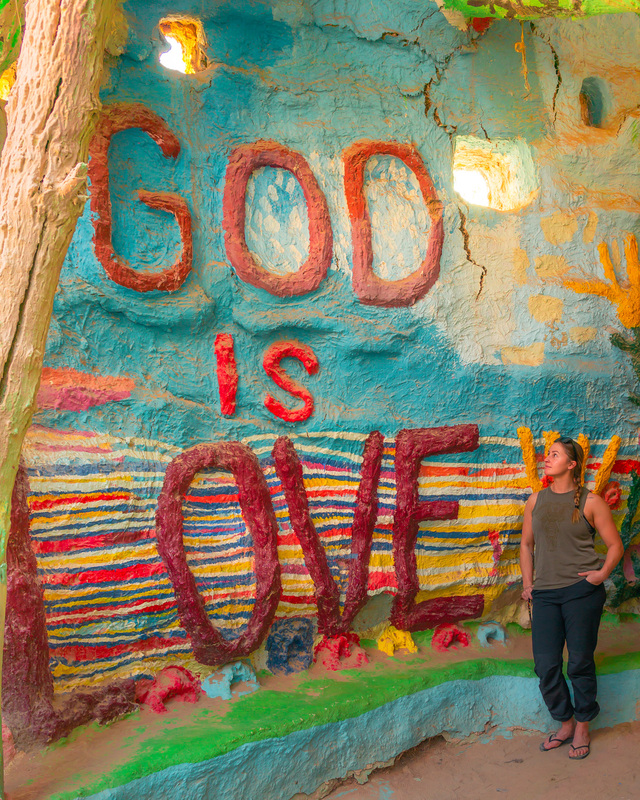 This interaction highlights the overall intention behind the vibrant artwork covering Salvation Mountain: sharing Knight’s simple but powerful message that ‘God is Love’. Ideally I would have liked to spend more time here, observing and understanding the culture further. I also regret not having time to wander down to East Jesus, an area of Slab City with its own history and intentions. I’ve copied the following from another page to provide more insight (further info here). Itself a reworking of the waste products of post-industrial excess, East Jesus is a place for those who continuously interact with and remake the world around them. It is the nexus of a sweeping wave of artists, musicians, photographers, inventors, travelers, and other assorted rebels and rogues and sworn brothers and sisters. It is a performance space for an aerialist troupe, a rest stop for a band on tour, the midnight testing ground of a sleep-deprived engineer, or the final resting place of a decaying art exhibit. It is a waypoint between cities, gigs, careers, love lives. It is the place a friend tries to tell you about after emerging wide-eyed from the desert one early morning — the place far from the skylines, past the mountain, beyond the edge of the pavement, up the dried river, surrounded by spent shells and shivering sand. Unfortunately, my van had been experiencing some issues since the prior evening, and the relentless glow of the ‘service engine soon’ light forced me to make haste back to the nearest town first thing in the morning. Maybe next year’s adventures will bring me back? I suppose that’s part of the unpredictable nature of #vanlife… lucky me. 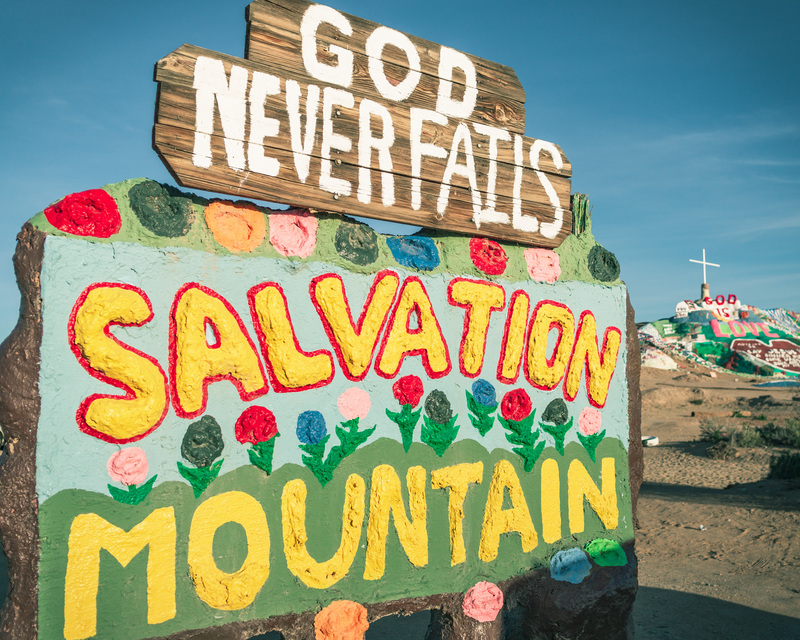 More information on Salvation Mountain here.